There is some very exciting and unexpected news for us dialysis patients! 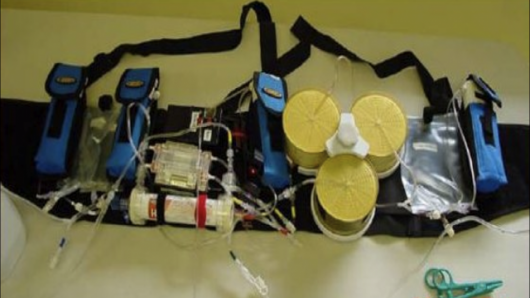 Dr. Victor Gura's Wearable Artificial Kidney (WAK) is soon going to be undergoing clinical trials. Under the United States FDA's new Innovation Pathway Program, this device among three devices in all have been selected for accelerated evaluation to bring them to the market. To be very honest, I did not expect this to happen for a few years. But to mine and everyone else's surprise, this program was recently announced and the WAK was one among the devices chosen! More details on how the clinical trials are going to be held are given in Dr. Peter Laird's blog here. I quickly did the math on the slide on Dr. Laird's blog and found that in less than a year the clinical trials are going to be completed. That is of course, assuming that the different stages will happen immediately one after another. That may not be the case. Two years maybe, then? Still not bad! When I put the WAK on the Cover Page of the first edition of the Quarterly Newsletter of the Hyderabad Kidney Foundation, I was accused by many of giving false hope to dialysis patients since the device was believed to be decades away from use by people like you and me. So, now you see? The hope was not false! But seriously, at that point even I believed it was decades away myself and said as much in my write up in the newsletter. Who knew that the FDA would bring up such a scheme and endeavor to bring these life changing devices to the people much sooner? How is this better than the NxtStage System One? Not sure if anyone can walk around with what is shown. It may perhaps offer very limited mobility. Unless this is an initial prototype and the final version will be able to withstand knocks without causing leaks from dislodged needles/tubes. 1. The System One needs a source of water or you need to carry the bags of dialysate which is a huge pain. This device does not need a source of water or bags. 2. Though you can't carry this around the whole day, it is MUCH more portable than the System One. The System One is like roughly 4 microwave ovens if you carry the Pure Flow water purification device which eliminates the need to carry dialysate bags. This can be carried very easily and you can use it wherever you go. 3. I am sure it will become smaller as they go along. But even in its current state, it is definitely much much better than the System One. hi kamal once i wrote you about my father. today he was put up ondialysis first time. i also read your earlier blog. it is true nothing stops in this world if some one dies but it becomes too difficult to believe for the associated person.